This collection of essays and other materials grows from a series of interdisciplinary projects involving more than 150 faculty and a significant number of students from Mercer University’s 11 colleges and schools between 2005 and 2010. 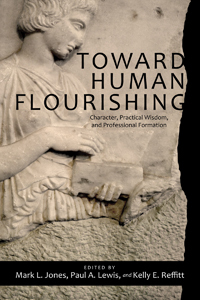 The book explores the relevance to contemporary education of a number of Aristotelian convictions: •	Authentic human flourishing in community with others requires good character—the acquisition of an ensemble of deeply ingrained knowledge, skills, and dispositions by which a person makes good decisions that promote the good. •	The “master virtue” of practical wisdom (phronesis) lies at the heart of good character by conducting this ensemble in particular situations so that the agent “does the right thing in the right way at the right time.” •	Notions of good character and practical wisdom are relevant for decision-making and action in personal, political, and professional contexts. •	Qualities of character can be learned by intentional, guided imitation so that one’s reasoning, passions, and actions more closely resemble those of “moral experts.” •	The development of good character and practical wisdom is intimately linked to, and shaped by, a sense of life’s meaning and purpose. •	The development of good character, practical wisdom, and sense of identity occurs across all levels of education: preK–12, undergraduate, graduate, professional, and continuing education. In light of these investigations, this book calls educators—whether teacher, scholar, or administrator—to join together across disciplines and institutions to foster practical wisdom throughout the educational continuum.